The Chad section has been archived. This organisation profile is no longer actively maintained and may not be accurate. 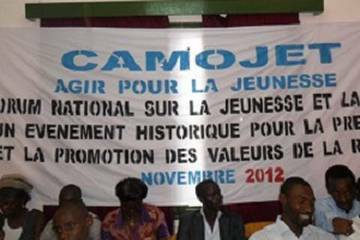 The Collectif des Associations et Mouvements de Jeunes du Tchad (Collective of Young People's Movements and Associations in Chad, CAMOJET) is an apolitical platform of young people's associations. Young people and Republican values: guiding citizens for the Chad of tomorrow. Chadians facing the challenge of national unity - how to construct a Chadian nation? The impact of sub regional conflicts on social cohesion in Chad. Young people, secularism and communal values. CAMOJET's work deals in particular with children, young people and women, and it specifically aims to defend minority rights. However, difficulties remain when dealing with certain sections of military, traditional, religious and administrative authorities. Young people are not helped by a lack of training and skills development opportunities, which often contribute to conflicts between young people and local authorities. This is not conducive to building a peaceful environment in which to support the defence of human rights in Chad. It is in this context that CAMOJET has organised several activities on peace research and inter and intra-religious dialogue in youth spaces. These work to improve young people's mediation skills and help them to take action in their respective communities. These activities have involved young leaders from groups around the country, including representatives of disabled groups, young parliamentarians and women's and religious organisations.